WTI oil price extends pullback from new five-month high at $64.77 on Monday, driven by negative technical signals as well as revived concerns about global supply. Initial signals of pullback on overbought conditions and stochastics’ / RSI bearish divergence have materialized and oil price entered corrective phase. 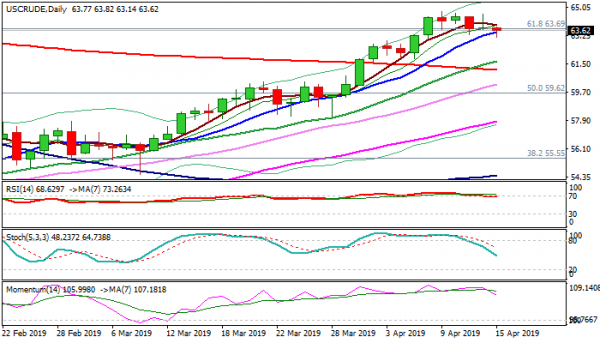 Weakening daily momentum adds to the sentiment, with fresh bears probing through significant support at $63.45 (10SMA). Close below is needed to generate fresh signal for further easing, as daily stochastic is in steep fall and showing room for further downside, while RSI reversed from overbought zone. The action for now looks like price adjustment before broader bulls resume. Initial scenario suggests shallow pullback, contained by 10 SMA (support is also reinforced by rising thick 4-hr cloud) that would keep immediate bulls in play, while deeper dips should fin d ground above $63.11 (200SMA). Revived concerns in the market regarding global supply, as US oil producers are on track for further output increase while other main world oil producers in the OPEC+ group decided to cut production in order to stabilize and tighten oil market. However, risk that the cartel may decide to stop output reduction by 1.2 mln bpd on its meeting in June exists and keeps markets cautious, as renewed oversupply threats could again slash oil price.